08: PhotoShield Cover for Motorcycles (US/CANADA) 50% OFF! Discounts Apply ! Now Available for Motorcycles. Patent Pending Technology. 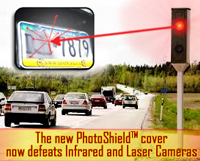 PhotoShield for motorcycles is designed to defeat most of the camera angles. It protects you against cameras mounted high over-head, on poles, bridges, overpasses, vans and side angles as well. So stealthy, most cops won't even know you have it on. This is the best selling product we carry. Get one before you get a $300 ticket in the mail.